This year I’m participating in the Sculpting January Challenge. The Goal is to become a better sculpting artist while creating 31 Models in one month. 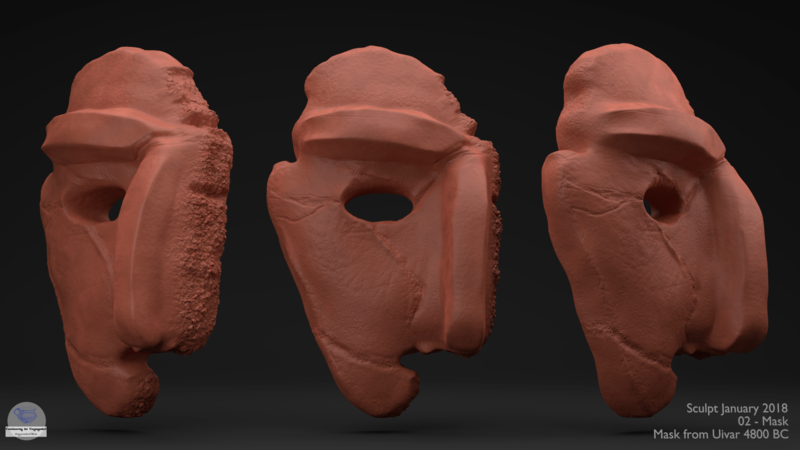 On the 2nd of January the topic was mask so I tried to recreate the mask from Uivar (Romania). The object was found in the early 2000s during an excavation of the Freie Universität Berlin Lead by Prof. Drasovan and Prof. Schier. The mask itself is roughly 6800 years old and was found in the center of the Tell (Gomila) at Uivar. Schier 2010, Die Maske von Uivar und ihr Kontext. This model is only a short artistic excercise in sculpting and in no way an scientific model or accurat scan. If you would like to join the Challenge just visit the Website for more information. It is a great way to improve your skills in sculpting as well as time managment. You don’t need expensive tools. The free Blender 3D includes all the neccesary tools. Dieser Eintrag wurde veröffentlicht in Rekonstruktion und verschlagwortet mit 3D model, mask, Maske, Romania, Rumänien, Tell, Uivar . Lesezeichen auf den Permanentlink.